The Columbus laboratory is one of Europe’s main contributions to the International Space Station. The European module recently completed integration at EADS ST and has now been officially delivered to Esa in readiness for its delivery to Cap Canaveral. The Columbus orbital laboratory is a major European contribution to the International Space Station. Tipping the scales at 13 t and with 10 science equipment racks, this scientific module will enable the ISS crew to perform numerous experiments in biotechnology, medicine, material sciences, fluid sciences and life sciences. Columbus recently completed integration at EADS Space Transportation’s facility in Bremen, Germany. 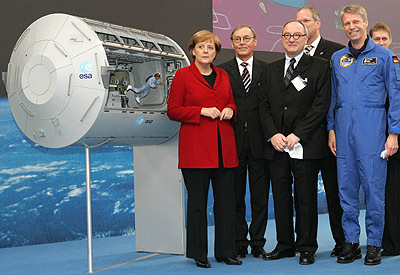 On 2 May, Esa and EADS Space Transportation officials attended a ceremony in the presence of Germany’s Chancellor Angela Merkel to mark the delivery of the module to Esa. Angela Merkel paid tribute to the depth of international cooperation involved in developing Columbus and in building and operating the ISS. 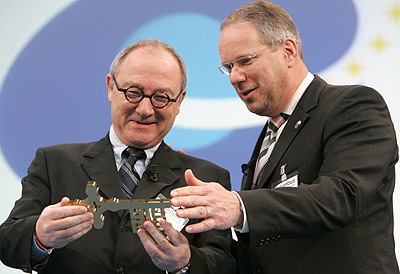 10 European nations are involved in the Columbus laboratory, the main contributors being Germany, Italy and France. Columbus is now preparing to leave EADS Space Transportation’s Bremen facility for Kennedy Space Center in Florida, where it is scheduled for launch in autumn 2007. Columbus will fly to the ISS on the U.S. Space Shuttle.